After breakfast, get ready for temple tour of Siem Reap. 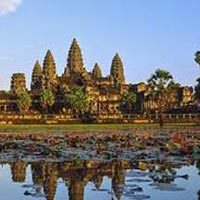 Start the tour with Angkor Wat temple- a wonderful proof of Khmer architecture. One of the most popular temples in Cambodia. 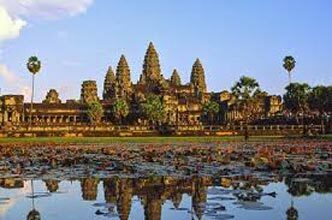 Of all the Angkor temples, this temple is the largest, is most important religiously and is known for its stunning carvings. Enter the main building, ascending through galleries. Before arriving at the central sanctuary, savor wonderful views of the surrounding. You visit Ta Prohm temple, one of the most popular Angkor temples, which lies amid unclear forest-like setting. Afternoon is scheduled for a visit to Angkor Thom. Spread in an area of 10 km, bounded by wide moats, this city is one of the most popular sights of Angkor. Enter from the huge South Gate, dotted with statues of gods and demons. Keep walking towards the Terrace of the Elephants and the Terrace of the Leper Kings- areas for public ceremonies. Explore the ruins of Baphuon, Royal Enclosure and Phimeanakas. Next in line is Bayon Temple- another popular temple in Angkor. Visit the galleries with bas reliefs. Dinner at a local restaurant.